In “Treehugger”, Francis Moss shifts the thematic focus from mushrooms and the forest to trees. The album is primarily classical guitar solos and duets with some electric guitar and percussion as colors. 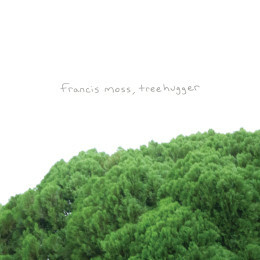 It is more nostalgic than previous Francis releases, while not abandoning the unique harmonic concepts and technical virtuosity that fans of Francis Moss and The Wonder Revolution have come to expect. Mark Foley: double bass on "Low Branches, Short Trunk" & "Pink or Violet Patches"
Steve Hatfield: percussion on "Inside a Husk", "Pink or Violet Patches", "Leaf Conversation", "Big-Cone Pine" & "Ancient Pine"
Chris Reichmeier: percussion on "Low Branches, Short Trunk"
Benjamin Hunt: spoken word on "Pink or Violet Patches"